It all started with a magazine. Those who have stopped by at Noble Rot in Bloomsbury’s Lamb’s Conduit Street might think it is a standalone outfit but it’s much more than that. 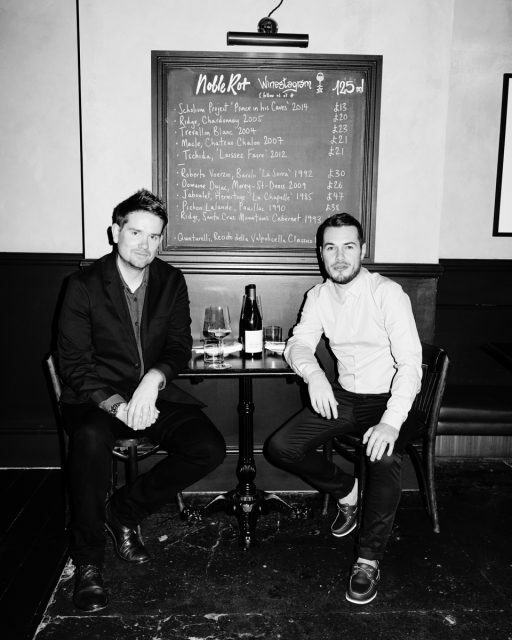 In 2013, Mark Andrew, who spent a decade at London merchant Roberson Wine, and Dan Keeling, who was managing director at Island Records, published a small journal called Noble Rot. Bright, punkish and covering wine and food, it catered, quite frankly and unashamedly, to the ‘wine geek’ community. With contributions from the likes of Marina O’Loughlin to Neal Martin, it offered (and still offers) an array of writing that approached wine and dining from a different angle to newspaper columns or other trade news. In 2015, this food-and-wine love-in translated into a branded bar and restaurant. The site they chose dates from 1700 and had been a wine bar since the 1970s. For a magazine that takes its embrace of the new and hip so seriously, the restaurant’s set-up is quite classic but the streak of humour and ethos of the title is there in the wine list and finer details. As Andrew (who became a Master of Wine in 2017) told Wine List Confidential previously, the whole point of the place, “has always been a collection of wines and producers that we love to drink, rather than an exercise in ticking boxes or covering bases”. Food meanwhile is provided by head chef Paul Weaver and consultant Stephen Harris, the latter hailing from gastronomic haven The Sportsman in Whitstable, who oversee a menu of seasonal fare described as ‘franglaise’ in style. The tone of the list is very francophile, leaning especially towards Burgundy, Beaujolais and the Loire but all are what Keeling and Andrew consider part of the ‘artisanal’ wave washing over the wine world, many not widely known, some undervalued, just as long as it’s ‘glou glou’.